Essex County Hall of Records » James Betelle, Where Are You? 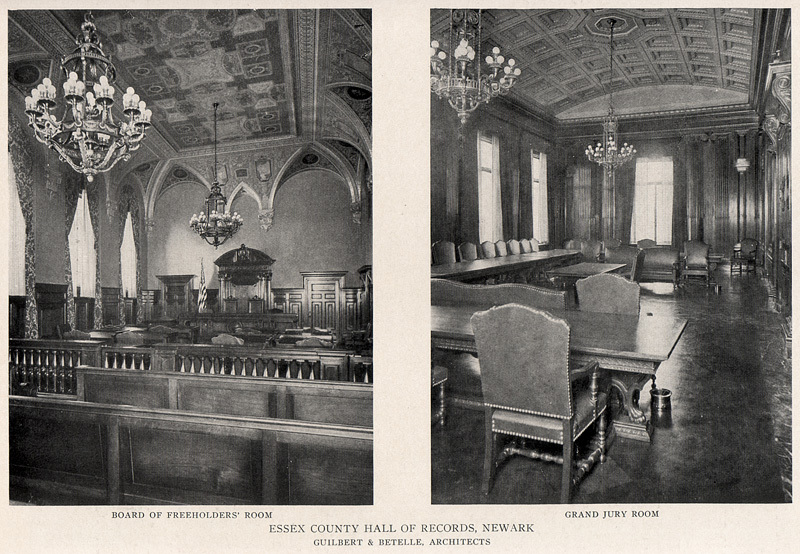 Guilbert & Betelle designed the 1927 Essex County Hall of Records, in Newark, as a complement to the existing 1902 Court House by Cass Gilbert (to which they did the massive remodeling described in this article). Interestingly, James Betelle worked for Gilbert about that time; it’s possible he was involved in its construction as well. Looking at the Hall today, it is remarkably untouched (both inside and out). Even the windows, often the first thing to go on older buildings, seem intact. The following article is from Architecture and Building, April, 1929. The photographs and plan are from The Architectural Forum, February, 1929. The new Hall of Records for Essex County stands on High Street in Newark, New Jersey, immediately behind the Essex County Court House built some twenty-five years ago. The character of the structure is in keeping with the Court House and the materials are similar. The base of the building and the walls and balustrade of the court before it are built of granite. The first story is of rusticated and bush hammered limestone and above, the walls are of plain limestone. The entrance portico has an Ionic order of free standing columns with a pediment above carrying a carved group. In plan, the building is a hollow square and of seven story height. A lobby at the front has opening from it an elevator lobby with three elevators on each side and adjoining it at either side, there are the two main stairways. At the rear of the building, there are two additional stairways. The plan is arranged so that there is a surrounding corridor on each floor with offices on the outside towards the street and within overlooking the court. The interior of the court it lined with cream face brick. The offices are plainly finished and designed for service. The Grand Jury room and the Board of Freeholders room are elaborately finished interiors in keeping with their purpose. These rooms were formerly in the Court House. The Essex County Court House which is undergoing extensive remodelling will be devoted entirely to court rooms. Several of the court departments formerly in the Court House now have space in the Hall of Records. Behind the Hall of Records is a new power plant building built of buff brick. This furnishes heat and other services for both the Hall of Records and the Court House. This arrangement made possible the removal of the heating and ventilating equipment from the Court House, thus making the basement of the Court House available for other purposes and increasing its capacity.